This post originally appeared at PROSPECT Blog. 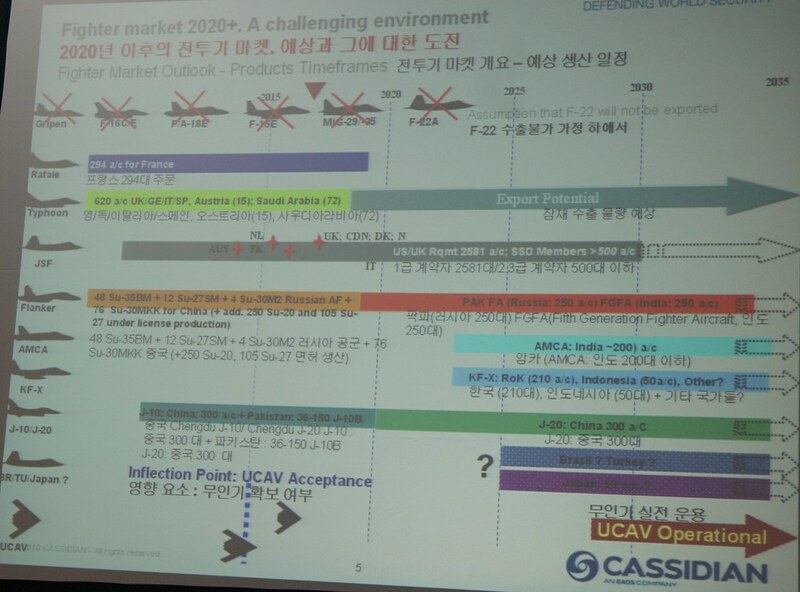 Trimble is most interested in Eurofighter’s forecast of a joint Brazilian-Turkish fighter by 2025. However, there are several interesting forecasts here — Eurofighter predicts that the Chinese Chengdu J-20 stealth fighter and the joint Russian-Indian PAK FA, which are both currently in early stages of development, will be operational by 2020. This is an ambitious time frame. Both the J-20 and the PAK FA are advanced fifth-generation aircraft that incorporate some degree of stealth and (presumably) supermaneuverability technology, ambitious technological advancements for both the Russian and Chinese defense industries. Remember, the Lockheed YF-22, the F-22’s predecessor, first flew in 1990, a full 15 years before the F-22 entered operational service in 2005. The PAK FA program’s T-50 prototype and the J-20 first flew in early 2010 and 2011, respectively, so a pre-2020 introduction to operational service for both programs would significantly undercut the F-22’s development cycle. How credible is this estimate? First off, it is important to take Eurofighter’s estimate with a grain of salt. In an age of European austerity Eurofighter GmbH lives and dies on export sales, meaning that it has an interest in talking up the threat of Russian and Chinese fighter programs to encourage sales of its 4.5+ generation Typhoon fighter. Eurofighter already makes a few dubious assumptions in this chart: Eurofighter GmbH — primarily a German, British, and Italian company — vindictively assumes that French rival Dassault’s excellent Rafale won’t achieve any export sales, and puzzlingly forecasts that the US-lead F-35 program will achieve its full 3,500 unit production run by 2030. Similarly, Eurofighter smugly predicts Typhoon export sales beyond 2035, which is certainly disputable given that the Typhoon has already lost high-profile export orders by Singapore and South Korea (though the Typhoon has been ordered by Saudi Arabia). This chart is fundamentally a marketing tool, and we should be aware that Eurofighter has an incentive to dismiss its French (Dassault Rafale), Russian (Su-35), and American (Boeing F-15E and F/A-18E/F) competitors and play up forecasted Russian and Chinese threats. That said, Eurofighter’s forecasted time frame for the J-20 and PAK FA’s entry into service is interesting. How credible is it? I have recently explored this issue in an interview with Tai Ming Cheung, an expert on China’s defense industry and the author of Fortifying China: The Struggle to Build a Modern Defense Economy, Dr. Cheung judged a pre-2020 introduction of the J-20 to be highly unlikely. Similarly, East Asian military expert Richard A. Bitzinger recently told me that he judged the T-50 to be “destined for a very long and painful R&D cycle, if it ever emerges from it at all.” This suggests that Eurofighter’s forecast is optimistic at best. However, the story is a bit more complicated. The J-20 likely has a more secure future than its Russian fifth-generation counterpart, for a simple reason: China spends roughly twice as much as Russia on defense, and China’s defense budget is growing much more rapidly. China’s expanding economy means that the PLA will be able to devote increasing resources to ambitious defense projects. China likely has the economic, if not technical, ability to field a fifth-generation fighter aircraft in the mid-to-near future, and by all appearances the J-20 is a high priority project within the PLA. International prestige is crucial to China’s leaders, and along with space programs and aircraft carriers, advanced combat aircraft are one of the most prestigious national technology projects. Similarly, China’s apparent aspirations for regional hegemony within the South China Sea arguably requires the flexibility of an internationally competitive maritime strike fighter, a role the J-20 appears well suited for. However, there are significant roadblocks to the J-20’s entry into operational service. 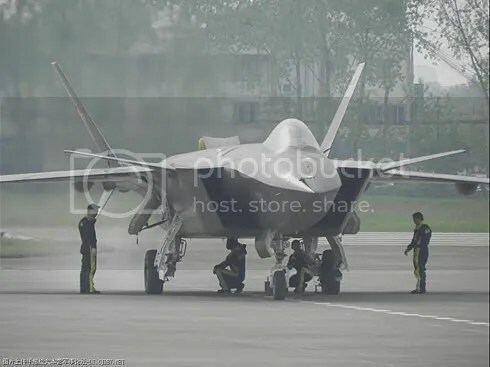 China has no experience manufacturing modern fighters — China’s current premiere indigenously produced fighter, the Chengdu J-10, is decades behind contemporary Western and Russian designs, and does not incorporate advanced technologies required for the J-20. Similarly, the J-10 currently utilizes Russian engines and Chinese industry has struggled to produce its own modern jet engines, a key (and often troubled) component of any aircraft program. While the J-20 prototype features indigenous engines, producing a production powerplant for an eventual operational variant will likely be a challenge. Similarly, Chinese industry has little experience working with the stealth technology and thrust-vectoring nozzles featured in most fifth-generation designs, and while the J-20 may forgo advanced stealth (especially advanced RAM coatings) and thrust vectoring in favor of affordability, these advanced features will likely remain challenging for China’s nascent but growing industrial base. However, these design choices are perhaps the strongest argument for relatively prompt introduction of a J-20 operational variant: by apparently deliberately choosing simplicity over the most advanced stealth and performance technology, the J-20 may be able to side-step the most challenging aspects of its development. Of course, China’s military leaders face the same resource constraints as other militaries. China’s military budget is growing but not unlimited, and other ongoing Chinese military procurement programs like the J-15 naval fighter and construction of 2 indigenous carriers could out-compete the J-20 program for limited resources. This possibility is supported by the J-20’s apparent irrelevance to a prospective Chinese military action against Taiwan, which would likely be decided by the ability of Chinese land-based anti-ship ballistic missiles to deter a US Navy intervention, rather than by a limited number of futuristic aircraft. The Russian PAK FA program faces what could be described as the opposite constraint: while Russian industry has extensive experience constructing modern aircraft, the Russian government’s chronically strained finances offer only limited resources to devote to speculative development programs. 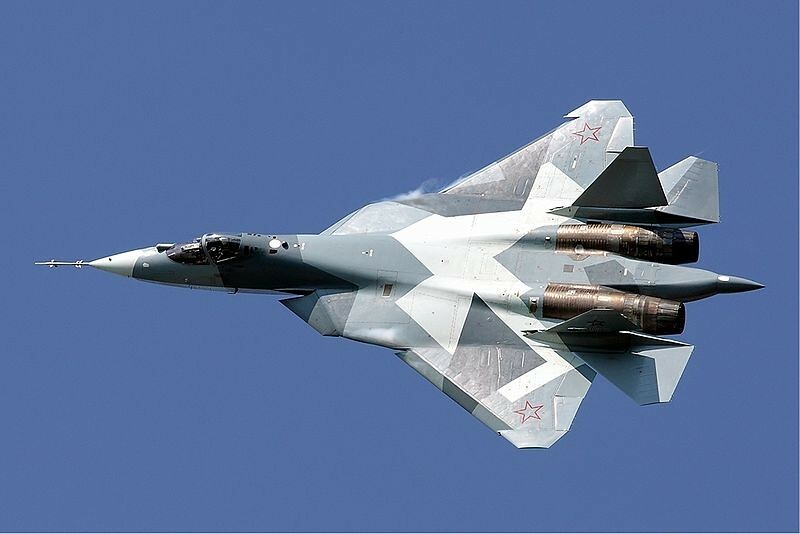 This scarcity motivated Russia to run the PAK FA program jointly with India, with the expectation that both parties would eventually purchase roughly 250 units each. However, despite previous Indian purchases of Russian Sukhoi Su-30, fighters’ international development efforts are fraught with difficulty, and it is uncertain whether the PAK FA program will ever result in operational aircraft. PAK FA T-50 prototype. Image by Maxim Maksimov. However, the Russian aviation industry has extensive experience producing advanced aircraft. Similar to the J-20, the T-50’s stealth and sensor equipment appear to be much less ambitious than what was designed into the American F-22, demonstrating moderation that greatly simplifies development. Additionally, T-50 manufacturer Sukhoi has extensive experience with thrust-vectoring nozzles from its mid-1990s Su-37 technology demonstrator, though Russian industry has little experience with stealth technologies. Finally, Sukhoi has clear incentive to promptly introduce the PAK FA. Due to the anemic Russian military budget, Russian manufacturers are much more dependent on international exports than their American counterpart, and in the next three decades a large number of up-and-coming powers are expected to purchase advanced combat aircraft. Because the PAK FA is Russian aviation’s only fifth-generation game in town, it’s now or never for Sukhoi: either introduce the PAK FA, or potentially lose lucrative international sales to more advanced European or American aircraft for decades to come. However, it’s unclear if these incentives will be able to overcome the cold financial limits and political uncertainty facing the Russian defense industry — despite Indian involvement, the PAK FA faces a rocky road to operational service. This analysis suggests that the Eurofighter forecasts for both the PAK FA and J-20 are overly optimistic. However, I’d argue that we are likely to see some version of a Chinese fifth-generation fighter before 2025, though probably not earlier. Prospects for the PAK FA are much less certain, but Eurofighter’s 2018ish service introduction seems to be an unrealistic best-case scenario.